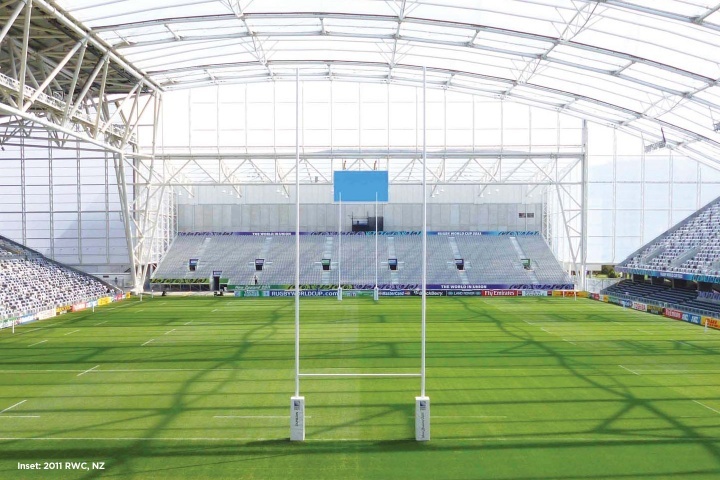 Situation: Following previous experience of supplying the 2011 Rugby World Cup in New Zealand, we were awarded the contract to supply posts for all UK venues chosen to host matches in the 2015 Rugby World Cup. While some, such as Twickenham and Kingsholm Stadium, are well-known rugby venues, seven of the 13 are football stadia – and importing 17-metre tall posts, complete with the 40 tonnes of concrete needed for each playing area, is not without its challenges. Solution: With the support of staff at the Milton Keynes Stadium – one of the football venues for the competition – we organised a focus group with all relevant groundsmen to discuss the logistics of installing rugby posts into traditional football venues, and to reassure them that we will be on hand during the event to provide ongoing technical advice. Outcome: The response of groundsmen has been hugely positive as we continue to prepare for the Rugby World Cup, which begins in the autumn of 2015 and which is due to be another world-class event, held in the UK with the support of Harrod UK. In September 2013, Harrod UK marked the two-year countdown to the Rugby World Cup by supplying 100 sets of RWC-branded steel rugby posts to communities across England.